A little more than a week after a litter of fourteen babies was born on June 1, 1997 to Tripod's parents, one of the babies apparently fell through the wall of the wire cage. The baby was found by 15 year old David when he came home from school. It's tiny body, cold but still alive, was directly under an upright vacuum cleaner a few feet away from where the cage was located. David carefully placed the tiny baby in the nest, where mother Toto welcomed it back. Although it already had grown fur, it was not yet old enough to go out on its own (eyes a few days from opening), and we were not at all sure that this little baby hamster would make it. David remembers that, like all the babies, it was black and white like father Ziggy, but that this one had little or no black on the rear of the body. The next evening, a count of the babies was done which seemed to confirm what was expected. Out of 14 babies, only 13 remained. We were sure that the little "lost" hamster had succumbed to the deprivation of spending most of a day alone on the floor. Case closed. At least for now. The babies grew and grew, and by the time they were running up and down the cage walls and eating for themselves, the little cage that housed the family became more and more of a mess. Twelve surviving babies were swarming all over it, along with Toto, Ziggy, and older brother Tripod. That's fifteen of them all together. It got to the point that the cage had to be emptied of its sawdust twice a day. There are two water bottles, and food is given in large portions 4-5 times every 24 hours. It was a mess. So a small area vacuum cleaner was put in the corner where that cage is kept to quickly clean up the piles of sawdust that fall on the floor. But something really strange happened the first time it was turned on. Of the 15 hamsters in the cage, 14 paid no attention whatever. But one hamster went absolutely ballistic!!!! A second or two after the vacuum cleaner came on, that one little hamster completely freaked out, jumping from one side of the cage to the other, skimming across other hamsters and crashing into the top and the walls of the cage. It was really amazing. It flew around the cage with incredible speed. This wierd and extreme reaction immediately caught my eye. I turned off the vacuum cleaner and the baby almost instantly came to rest on the side of the cage, eyes half open and half closed as if in a trance. I picked the little thing up and there was no reaction. No breathing, no eye blinking, no movement of any kind. I thought it died. I could roll it over in my hand and it was limp. I was completely puzzled. I placed it gently back into the cage, and it just froze for a minute, then "came alive" and ran under mother Toto, where it hid. I went on to work wondering what had happened. I still wasn't sure the sound of the vacuum cleaner had anything to do with it. And the incident was forgotton by the next morning when the task of cleaning up the cage started again. I turned on the vaccuum cleaner the next day to clear up the mess and again one tiny hamster out of fifteen went into an absolute frenzy. I quickly turned off the vacuum cleaner, retrieved its "lifeless" body from the wire side of the cage, stroked it and gave it back to Mama. Day three. Now I am ready to clean up the mess again, but I hesitate. I am afraid of another incident with the baby hamster. So I look through the herd and can't pick that one out. I only remember that it has more white on it than most of them. Oh well, it's time to go to work. So I turn on the vacuum cleaner. And, of course, there is a repeat performance of all the same strange incidents. This time, Toto is less than anxious to take back the little traumatized baby. I feel terrible. I pick it's little unresponsive body back up and make a drawing of its markings. Tomorrow, I'll catch this one and put it someplace else before I vacuum. By now we've started to call this strange young creature "The Spook." That night, I clean up an old cage that we are no longer using and get it ready for The Spook. But as hard as I tried to identify The Spook out of a litter of 12, I cannot do it. There are three possibilities. They all look so much alike. And I don't even know if The Spook is a male or female. I have no choice but to briefly turn on the vacuum cleaner and seize the one that reacts to it. So I do. The vacuum comes on, the little hamster crashes into the wall and flies across the cage -- in total terror. I right away turn off the vacuum cleaner and there it is again, little feet clinging weakly to the wire cage side. I remove the poor thing and place it gently in its new home. There the baby lay still on the bedding for several minutes -- its hind legs stretched out sideways exactly as they were when it was clinging to the side of the cage. There is no motion of any kind. It is physically frozen. Its eyes look glazed. I can't even tell if it is breathing. After three or four minutes of this, I turned off the lights for a minute and then turned them on. The Spook had then pulled to a more normal pose, but still was not reacting to anything. It was fully ten minutes before it started acting completely like a normal hamster. Now The Spook has a new cage away from the vacuum cleaner. And there was another disadvantaged member of the same litter -- one so tiny it was barely a third the size of the rest. That one was put in the new cage with The Spook in the hopes that a less competitve environment would help it grow -- but mostly because The Spook surely needs company. The Spook and the runt are now happily settled in our old habitrail-style cage. They get moved out of the room before anyone runs a vacuum cleaner, even though the panic reaction happened only when the vacuum cleaner was operated in the immediate vicinity of the cage. Is The Spook the same baby that fell out of the cage and got found under the vacuum cleaner? Had it perhaps been sucked up part way into the machine? Can month-old hamsters remember incidents that happened in the first 7-9 days of life? Are they psychologically complex enough to have panic attacks brought on by sounds associated with a bad experience? Are they capable of resonding to emotions buried at the subconscious level? 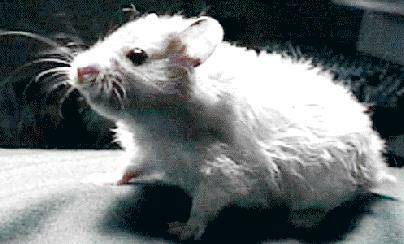 Can hamsters actually go into shock from a mental reaction to a memory? We don't pretend to know. But what else could explain this odd behavior? There is no peculiar reaction from The Spook to any other noise -- indeed, there is nothing else different about this young hamster's behavior at all. So the sad, scary story has a happy ending. The Spook stays with us. Who else would understand -- or even believe -- the special care this little one needs? Please come back often for updates. We'll post more Spook pictures here soon. July 7 update: The Spook is a girl! Early Friday morning, 18 July, 1997, The Spook's little sister, the runt, was found dead on the floor of our apartment, the obvious victim of a cat attack. The top of their little plastic module cage had been pushed aside and both The Spook and the little sister were gone -- only Tripod remained inside. The little one had grown tremendously, and we were terribly proud of her. Her loss is a painful shock to us. She was laid to rest in the park behind our apartment building on Saturday evening, 19 July. The Spook remains missing. She has not been seen since the escape, although for a while we hoped and really believed that she would be found. Three days after the escape, there was a sound very much like that made by a hamster which came from the metal cover of a air conditioning unit in the apartment. A live trap was set for her, but she was never caught. In fact, there has been no indication whatever since that time that The Spook might still be alive. We sadly wish our little Spook goodbye, and we hope that she left this world knowing that she was truly loved and that she will forever be missed.